There are so many types and brands of shampoo in the market nowadays that makes it hard for us to decide which one is ideal for us. Co-developed with Moltobene, one of the biggest Japanese salon product manufacturer with 38 years of history, Hair Pro Heat Active range is created exclusively for hair that’s subjected to heat – those who use hairdryer, curling and straightening irons. So, instead of damaging your hair, the heat from these devices will work with these amazing Hair Pro products to give even better care to your hair. Reacting and combining the amines decomposed from protein, NanoRepairTM-EL will stay in the hair core after binding, and this means our hair will be glossy and elastic even after repeated hair washes and blow dries. Hair Pro products are also enhanced with a non-silicone formula to promote effective absorption of oxygen for our scalp. When we use silicone-based hair products , it sometimes cause problems for our hair and results in hair loss and itchy scalps and this will not happen with Hair Pro!! The Hair Pro by Watsons Heat Active series consists of a range of shampoo, treatment, hair mask and hair serum to solve the most important hair related problems. - Formulated with NanoRepairTM-EL which can penetrate into each hair strand to help improve elasticity, smoothness, suppleness and shine. - Free from Parabens, Mineral oils, Silicones, UV Absorbers, Artificial Colourants and Sodium Lauryl Sulfate/Sodium Lauryl Ether Sulfate. - Certified Natural Organic Hybrid Rice Extract and Green Tea Extract from Japan to give your hair moisture and softness. - Professional quality products provides you with intensive and nourishing salon hair treatment effects. Speaking at the launch event, Watsons Celebrity Friends, Cathryn Lee – Movie actress/model, testified her experiences with the new products which styled by the stylist. Cathryn is always seen with her long healthy and hair both on screen and behind scene. She highly recommend Hair Pro products for those who are enjoy with the hair salon treatment at home with very affordable price, meantime it’s effective in combating hair problems and the ability of the products as confidence ‘booster’ to look great always. 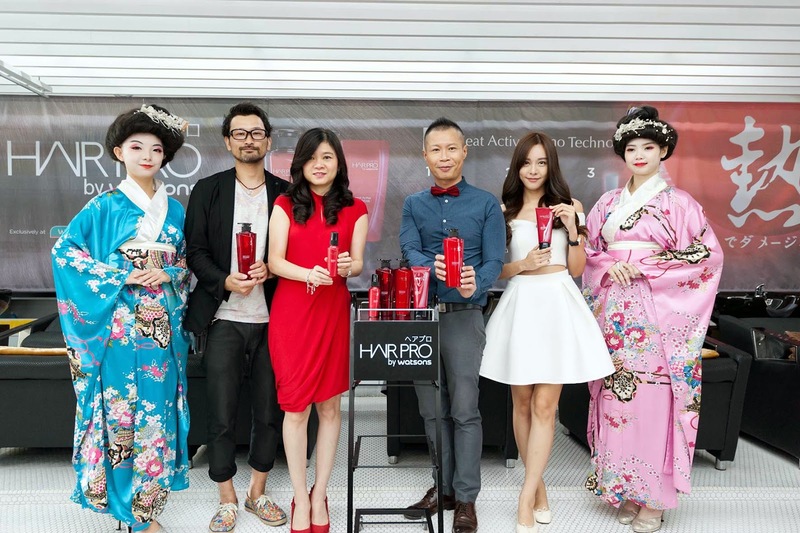 The Japanese hairstylist, Takeshi Odera made a special appearance during the product launch and demonstrated to the interested audience as to how customers can use Hair Pro products to repair their damaged hair from frequent hair blowing, straightening irons and curling. “I personally love the shampoo as it produces plenty of foams and bubbles! Even after just applying the shampoo for hair wash before using the treatment serum , the hair feels smooth. The hair mask gives an immediate result too, to repair the damaged hair. Overall I love these products as its free from parabens and other chemical ingredients which can be harmful to our hair scalp.“ said Takeshi Odera. Takeshi Odera is a very dedicated stylist for a number of satisfied customers and celebrities. In Kuala Lumpur, Takeshi Odera is the Director Hairstylist for “Number76 Hair Salon”, which has five branches in Malaysia. Launching the product were Caryn Loh, Watsons Malaysia General Manager of Trading and Danny Hoh, Watsons Malaysia Head of Marketing. They joined Cathryn Lee & Takeshi Odera on stage to unveil the latest Hair Pro by Watsons Heat Active range. Available exclusively at Watsons, Hair Pro by Watsons Heat Active range uses an advanced technology from Japan that harnesses heat energy from blow drying and heat styling to active NanoRepairTM-EL, an ingredient that delivers restorative and protective benefits to your hair. Hair Pro Shampoo features a gentle formulation that provides through daily cleansing of hair and scalp with gentle, subtle lather. Going beyond ordinary conditioners, Hair Pro Treatment comprehensively restores and repairs for smooth, silky and moisturized healthy hair. Performing intensive repair of damage to restore full hair body and richness, Hair Pro Mask is applied after showering and before using a hair dryer or curler. Recommend to use twice a week. Designed to revitalize hair and restore moisture with a non-rinse formulation, Hair Pro Serum can be applied in the evening for overnight hair restoration and great styling the next morning. Hair Pro by Watsons Heat Active can be found NOW at Watsons exclusively! For more information about Hair Pro by Watsons, please visit www.facebook.com/watsonsmalaysia or Watsons official website www.watsons.com.my .